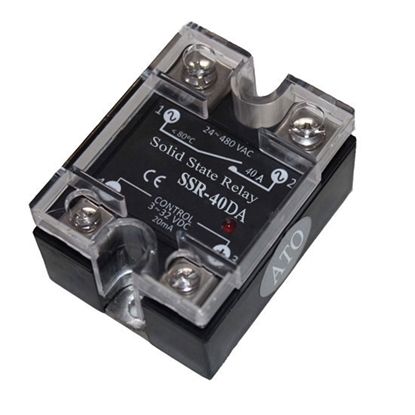 A solid state relay (SSR) is a non-contact switch composed of microelectronic circuits, discrete electronic devices, electronic power devices, realizing the isolation between the control side and load side. A solid state relay is applied to control high current load with inputting a small control signal. Compared with the electromagnetic relay (EMR), the solid state relay is more reliable, non-contact, long life, high speed and little interference, and it has been widely used. 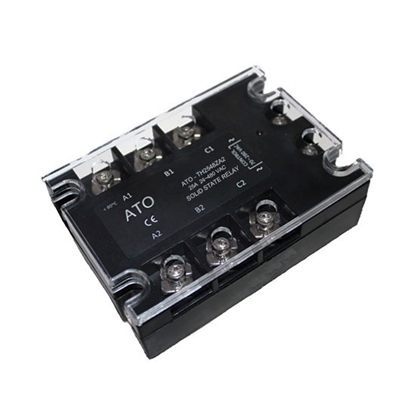 ATO provides single phase and three phase solid state relays, including DC-AC and AC-AC, with load current from 10A to 120A. More details are as below and you can select a most suitable one to switch on/off your facilities or machines. SSR-10DA, 10A single phase solid state relay, DC to AC, control voltage 3-32V DC, load volatage 24-480V AC. Excellent quality, high reliability and long lifetime. SSR-10AA single phase solid state relay 10A, AC control, input 70-280V AC output 24-480V AC, high quality and nice reliablity, suitable for frequent switching occasion. Low price 15 amps single phase solid state relay, SSR-15DA, 3-32V DC control voltage and 24-480V AC load voltage, with LED indicator. Strong structure and high performance. Single phase solid state relay (SSR), AC control, load current 15 Amp, input voltage 70-280V AC and load voltage 24-480V AC, with LED indicator and panel mount. High reliability and favorable price. SSR-25AA, single phase solid state relay, zero cross, load current rating 25 amp, AC control voltage 70-280V AC, load voltage 24-480V AC, panel mount, strong structure and high reliability. Brand new solid state relay 40A, zero cross, control voltage 3-32V DC, load voltage 24-480V AC, LED indicator, panel mount, low cost and high quality SSR, ideal for automatic process control applications. 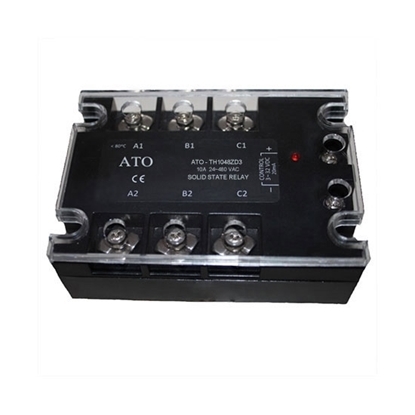 Favorable price AC to AC solid state relay (SSR), single phase, zero cross, switch the load current up to 40 amp, with input voltage 70-280V AC and load voltage 24-480V AC. Long service life and high quality. Solid state relay SSR-60DA, load current rating to 60 amp, 3-32V DC control voltage, 24-480V AC load voltage, with LED indicator, zero cross, ideal for frequent switching occasions. Brand new SSR-60AA solid state relay, 60A load current, AC control, 70-280V AC input voltage, 24-480V AC load voltage, zero cross, LED indicator, panel mount. Hight quality yet low cost. SSR-80DA, load current rating to 80 Amp, 3-32V DC input voltage, 24-480V AC load voltage, DC control solid state relay, excellent quality and low price, high reliability and long lifespan. SSR-80AA single phase solid state relay 80 Amp, AC control, zero cross, control voltage70-280V AC, load voltage 24-480V AC, LED indicator, panel mount, excellent quality and economical price. Cheap single phase solid state relay, SSR-100DA, DC to AC, 3-32V DC input voltage, 24-480V AC load voltage, 100 Amp load current SSR, zero cross, LED indicator, panel mount, strong structure, high quality and long life time. SSR-100AA single phase solid state relay 100 amp, AC to AC, control voltage 70-280V AC, load voltage 24-480V AC, zero crossing SSR, panel mount, high reliability and favorable price. Low cost 120 Amp single phase solid state relay SSR-120DA , zero cross, input voltage 3-32V DC, load voltage 24-480V AC, LED indicator, excellent quality, high reliability and brand new. Single phase solid state relay SSR-120AA, load current rating up to 120A, zero cross, AC control,70-280V AC input voltage, 24-480V AC load voltage, brand new, high quality and long life time. 3-phase solid state relay, SSR-10AA, input voltage 70-280V AC, load current 10 amp and load voltage 24-480V AC, panel mount, LED indicator, high quality and long lifespan. SSR-10DA solid state relay, 3-phase 10 Amp, DC to AC, control voltage 3-32V DC, load voltage 24-480V AC, fast switching speed, high reliability and long lifespan. 25 Amp 3-phase solid state relay, SSR-25AA, input voltage 70-280V AC, load voltage 24-480V AC, LED indicator, panel mount, excellent quality and brand new, general purposer SSR for wide applications. Cheap SSR-25DA, 3-phase solid state relay, load current rating to 25A , DC control, input voltage 3-32V DC, load voltage 24-480V AC, panel mount, compact size, high reliability and long lifespan.